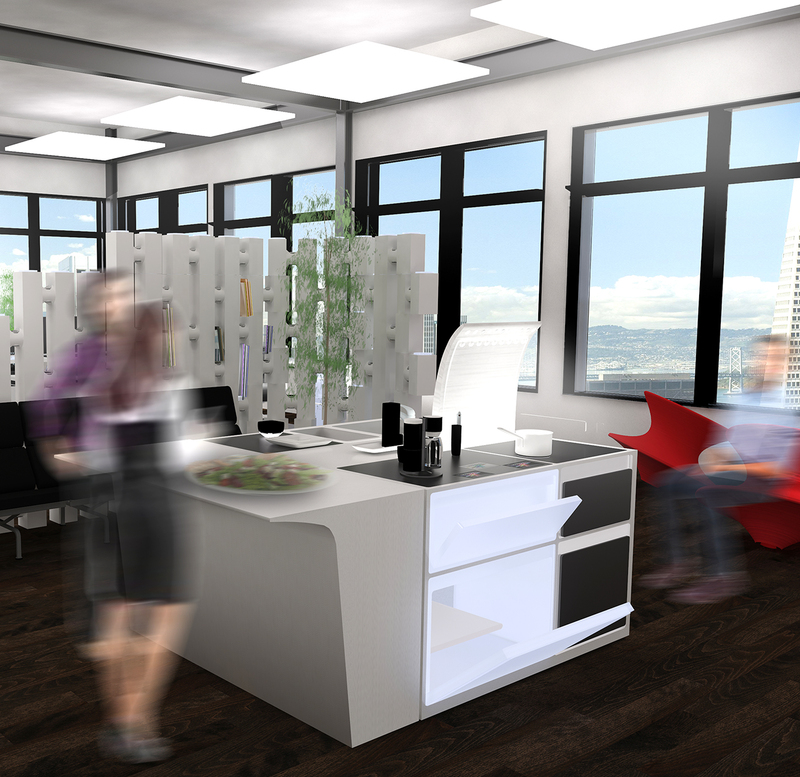 The future workplace caters to collaboration while providing individual control of the personal space. 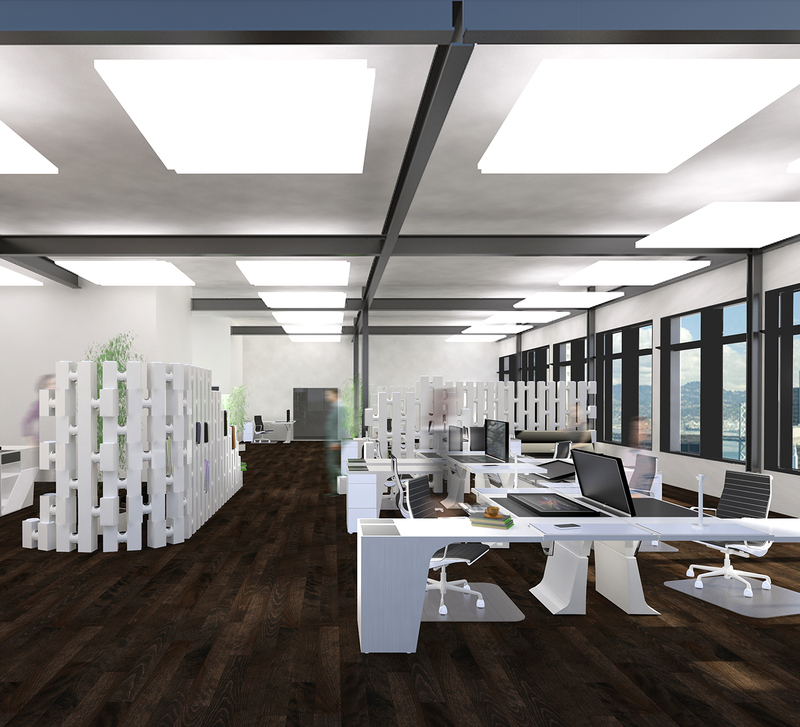 The individual space needs to be functional, productive, comfortable, healthy, customizable, and sustainable. This individual space also needs to structure an environment that will foster the generation and development of ideas born from many. Creativity is not bound to the confines of a desk in the same way that communication is not limited to the formality of the conference table. We are proposing a future that encourages workers to investigate their ideas free from the rigid boundaries of a traditional office. We developed five components that were essential to the future. 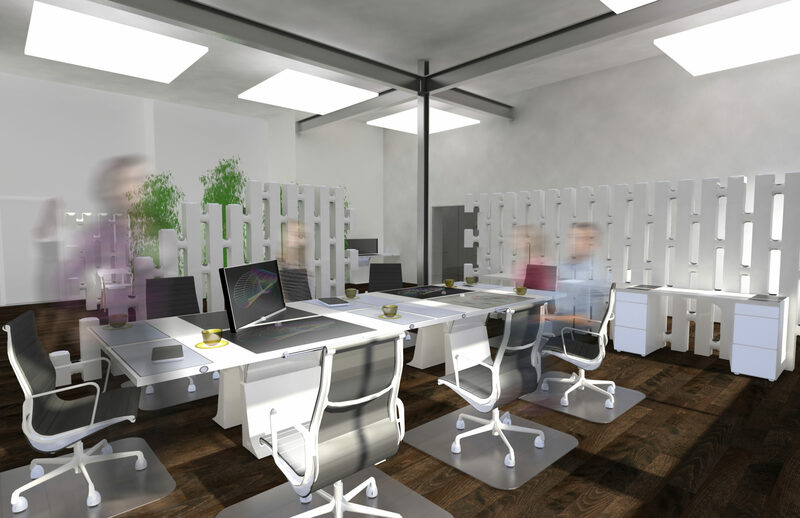 These components include a Hub, a Cartridge, a Chair with built-in environmental controls, a Modular Kitchen to provide storage and dining space, and a Modular Partition to improve interior environmental qualities. The composition of these components is flexible. 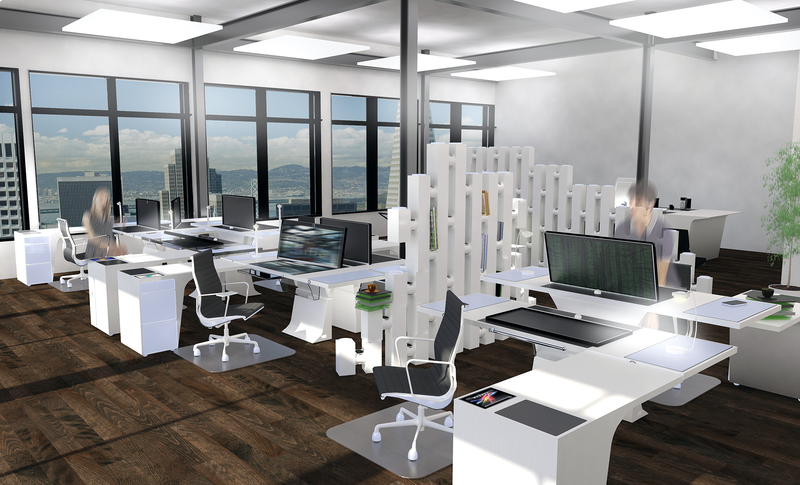 The Hub integrates many traditional desktop furnishings into a single unit while introducing some new elements as well. A Touch Screen Work Surfaces lies horizontally into the Hub structure. This device recognizes the physical location of other Hubs when connected and provides intuitive interaction similar to Samsung SUR40 with Microsoft TouchSense. Another Touch Screen Work Surface folds up with motion detection, camera, and scanning abilities. This surface serves a the primary viewing screen and also as a privacy screen with nominal 2” fins when standing vertically. It folds down to promote informal discussions with colleagues. The side fins effectively raises the screen surface leave any desktop objects to remain. In addition, the scanning component will allow quick categorization of any physical documents. A Rewritable printer, similar to Toshiba B-SX8R, will recycle any physical documents to be minimized and reused. It will physically connect to the Hub. 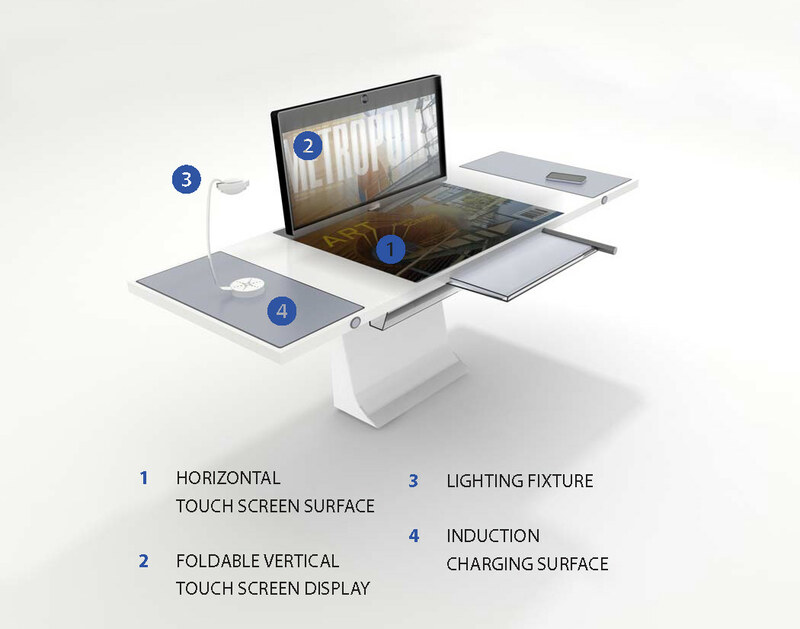 Induction Charging Surfaces, similar to Duracell Powermat, for Equipment are inserted into the Hub structure allowing for wireless charging and power transfer of surface top equipment such as phones, light fixtures, and any desktop electronics. Light Fixtures are powered through the Induction Charging Surfaces. Various light fixtures can be selected per the personal preference. The Main Hub Structure utilizes stamped aluminum structure as support. It is an efficient and fast way to produce, similar to automotive body panels, and can be recycled. Horizontal surfaces and drawer/shelf components are generated from recycled wood utilizing non-VOC binder. All structural components of the hub are recyclable. The Cartridge stores personal information and belongings. 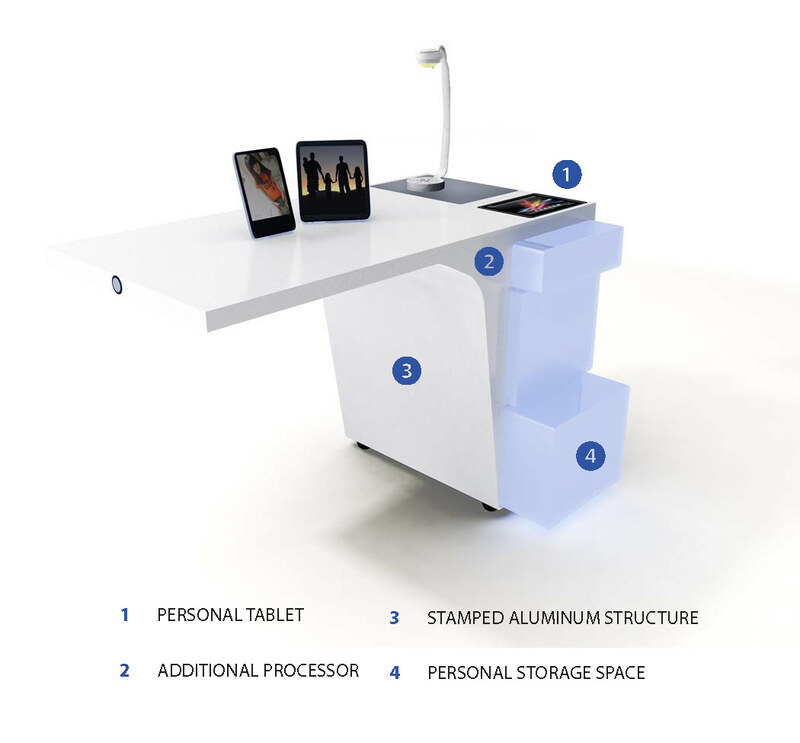 A tablet dock is built into the desk surface and allows for a user to synchronize all of their mobile records with those located in the personal processor. Additional computing and processing components are located with the Cartridge structure. It can utilize industry standard motherboard components that can be upgraded as required. 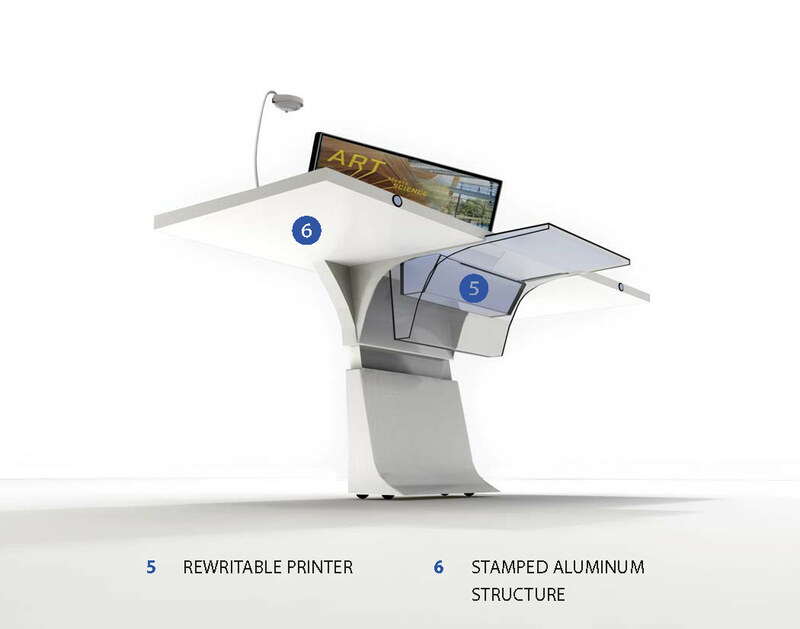 The Cartridge Structure utilizes stamped aluminum structure as support. It is an efficient and fast way to produce, similar to automotive body panels, and can be recycled. Horizontal surfaces and drawer/shelf components are generated from recycled wood utilizing non-VOC binder. All structural components of the hub are recyclable. The Cartridge houses personal belonging and can be relocated to any Hub location. The Chair is a technologically improved Eames office chair. 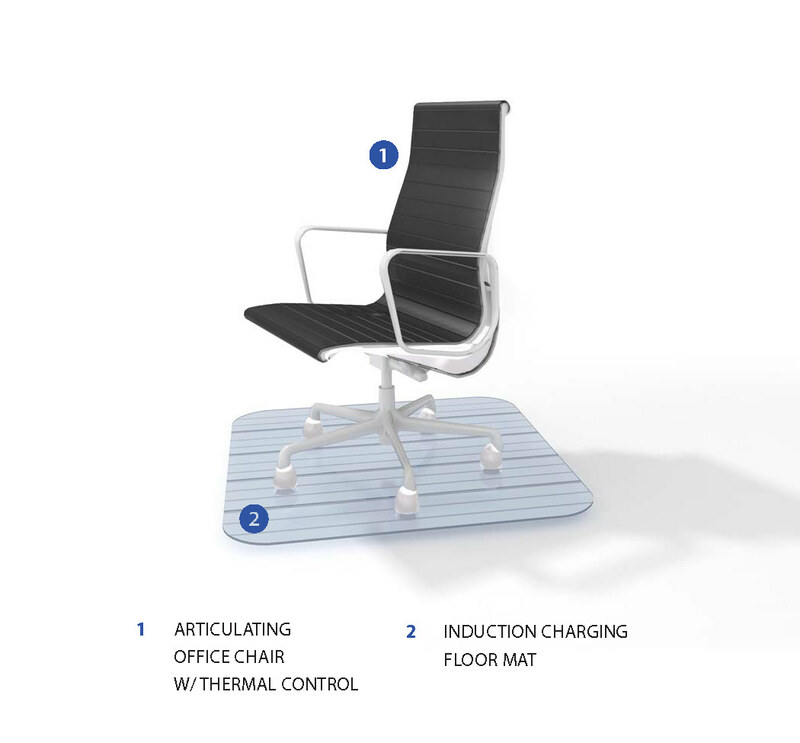 An Articulating Office Chair with Built-in Thermal Control gives users a personable climate. An Induction Charging Floor Mat provides power through the wheels up into a built in heating/cooling pad. The Modular Kitchen more than your average workplace kitchenette. Food can be brought from home and stored in the drawer refrigerator/ freezer. Soups can be warmed on the induction oven. A microwave allows for quick meals. An induction stove provides the ability for larger meals and caterers to come into the workplace. A self contained Ionizing Hood collects and filters cooking fumes. A dishwasher allows for quick clean up after meals. The kitchen sink allows for someone to wash vegetables if they are preparing a salad. 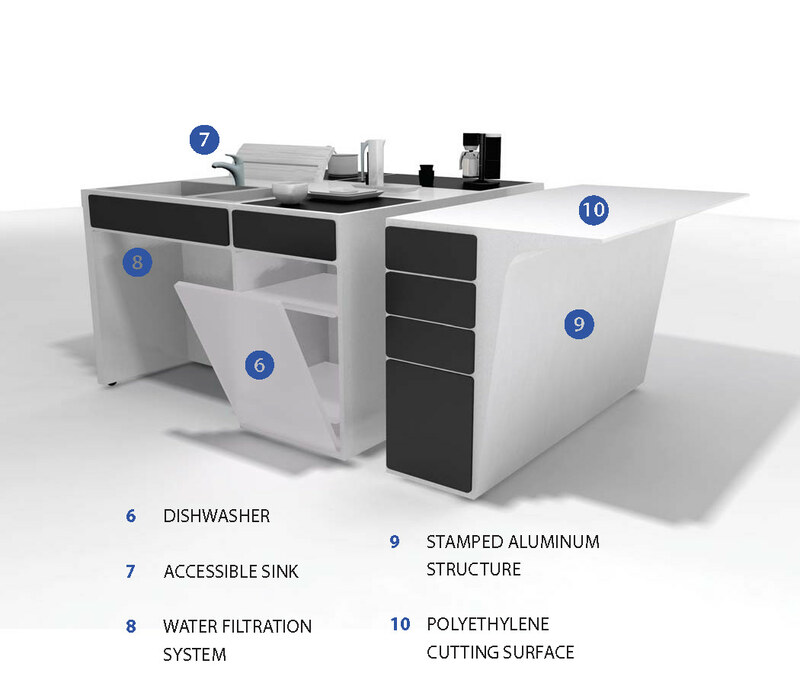 The water filtration system provides a source of reliably clean drinking water for the office. A point of use water heater conserves energy by only bringing the water used up to temperature. The Kitchen Structure utilizes stamped aluminum structure as support. It is efficient and fast way to produce, similar to automotive body panels, and can be recycled. A Polyethylene cutting surface provides ample preparation space. 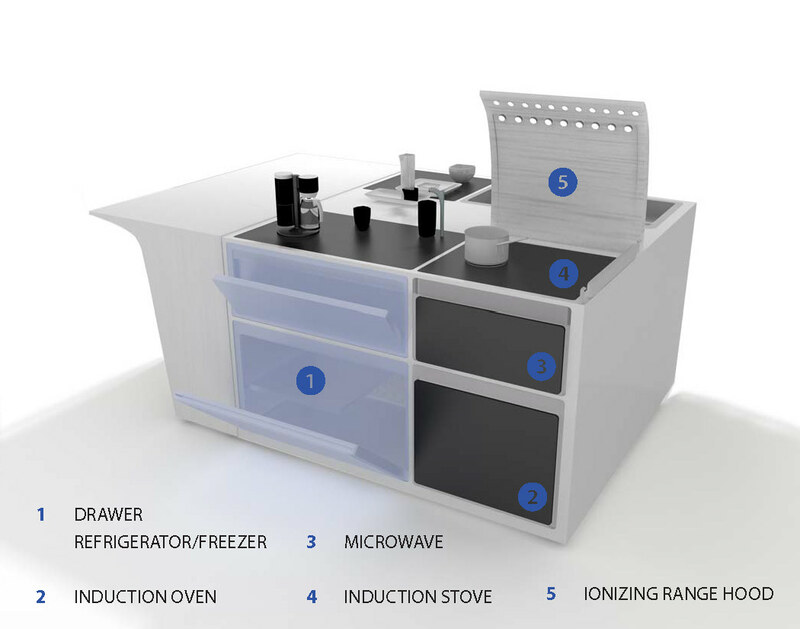 Components in the modular kitchen can be independently set up with minimal utility connections. It requires cold water, sanitary sewer, and electrical connection. The Modular Partition does a lot more than separate space. Injected molded Modular Partition blocks are designed, similar to Movisi Link, in such a way that they can be stacked and rotated to create barriers of any height and direction. The injected material, Polyacitide, was chosen as it can be easily composted. The blocks are counteracting noise pollution using a diffraction resonator to absorb sound without using any type of screen. 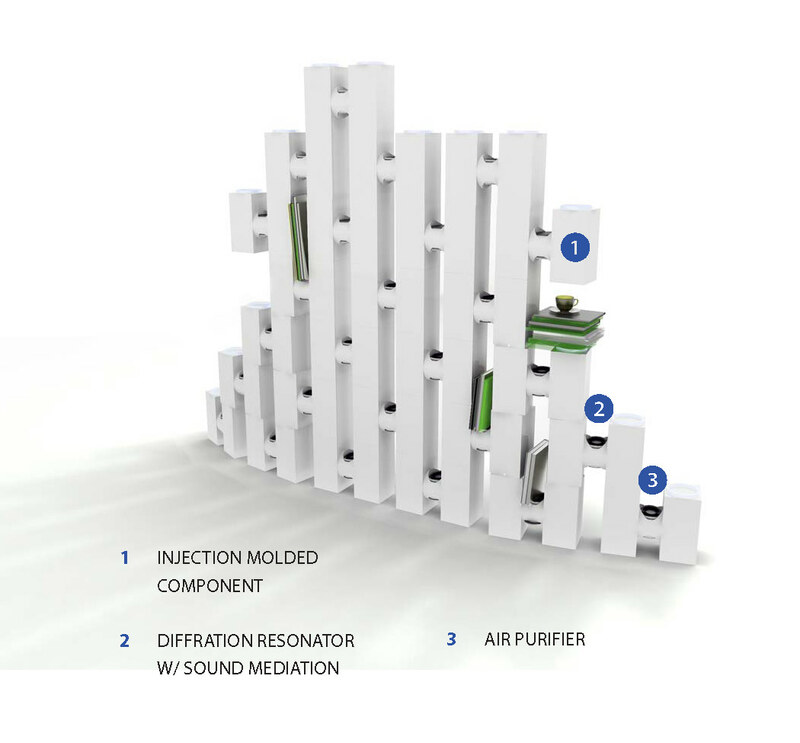 They are also constantly improving air quality by filtering allergens and pollutants.